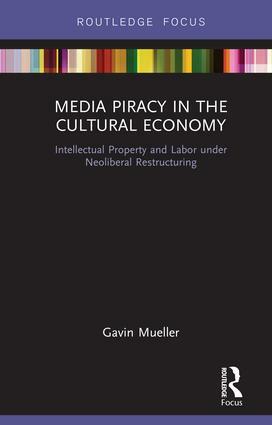 This book takes a Marxist approach to the study of media piracy – the production, distribution, and consumption of media texts in violation of intellectual property laws – to examine its place as an endemic feature of the cultural economy since the rise of the Internet. The authorexplores media piracy not in terms of its moral or legal failings, or as the inevitable by-product of digital technologies, but as a symptom of a much larger restructuring of cultural labor in the era of the Internet: labor that is digital, entrepreneurial, informal, and even illegal, and increasingly politicized. Sketching the contours of this new political economy while engaging with theories of digital media, both critical and celebratory, Mueller reveals piracy as a submerged social history of the digital world, and potentially the key to its political reimagining. This significant contribution to the study of piracy and digital culture will be vital reading for scholars and students of critical media studies, cultural studies, political theory, or digital humanities, and particularly those researching media piracy, digital labor, the digital economy, and Marxist theory. Gavin Mueller was born in Columbus, Ohio. He holds a PhD in Cultural Studies from George Mason University. He currently teaches New Media and Digital Culture in the Media Studies program at the University of Amsterdam.